Udid dal dangar pachadi or uddinittu / uddin hittu recipe is a traditional recipe from Karnataka and Maharashtra state. This healthy urid dal flour recipe provides the much needed protein to our body and needs very few ingredients. In addition to that it is quick to make. It is a good winter food recipe. Urad dal Dangar pachadi is usually served with hot plain white rice, chapati. Udid dal / white lentils is also known in Indian languages as udadachi dal , uddin bele / uddu/ ulandu parappu etc. in Indian languages. You may use roasted urad dal flour raw. 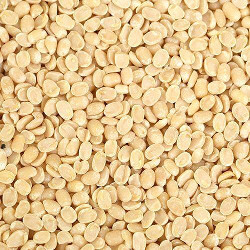 Urad dal is easily available everywhere in India. 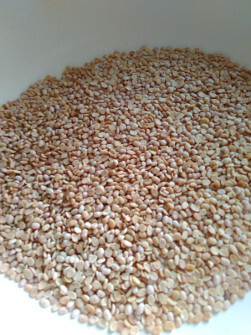 We need urad dal flour to make udidache dangar, so you may either use store bought urad dal flour or make it at home by grinding it in a grinder or blender. Add urad dal flour to a mixing bowl. add yogurt to the flour and mix well without lumps. Add a little water according to the consistency you want. Add salt, chopped green chili, and ginger. mix well. Add oil to a small pan. when oil is heated, add mustard seeds and cumin seeds. When seeds start spluttering, add hing/asafotida. Add dry red chili or sandgi mirchi (whichever you are adding). Switch off the flame and let cool a little. Add the tempering to the prepared urad dal dangar mixture. Serve with plain white rice or with chapati or paratha. You should use fresh plain yogurt. If you like it with slightly sour curd, you may use that. I usually do not use sour curd. You may use green chili or sandgi mirchi or curd chili according to availability and your liking. I prefer sandgi mirchi. You may add a pinch of sugar if you like.